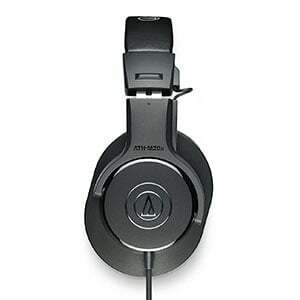 Audio Technica’s line of studio headphones has been known to be reliable for a while now. Today we are going to take a look at the smallest member of the family, the ATH-M20x. Let’s find out why these are some of the best studio headphones under $50 at the moment. The very thing that made Audio Technica so popular is their ability to produce affordable gear that actually works. Same goes for their headphones. ATH-M20x aren’t the flagship model of the series, but even so they bring a number of solutions shared across the entire family. On a first glance, they look fairly robust. There’s plenty of padding to go around both on the ear cups as well as the head band. In that regard, they are solid. Design itself is a pretty common one. We are looking at swiveled, fully closed over the ear cups. Once put on, the pressure isn’t too bad, which is something many were worried about. As a matter of fact, the grip is quite comfortable. Aesthetically, ATH-M20x are about as plain as they come. However, there’s only so much we can expect at this price. In terms of features, there are two things we need to mention right away. First one is the choice of transducers. We are looking at two 40mm drivers that have proven to be pretty impressive. Ear pads are so and so. Audio Technica used that cheap vinyl like most other brands do in this category, however they still managed to ensure some comfort. Headband is adjustable using that standard retracting mechanism. This is probably the biggest flaw ATH-M20x has. The insert that actually extends from the headband is pretty thin and probably too fragile. That isn’t to say that you’ll break it after a day of use, but you definitely want to be considerate when adjusting the fit. Cable is fixed to the headphones, but it’s some 10 feet long so you should worry about running out of it. Audio Technica also delivers these with a 1/4″ TRS adapter. Performance is by far the best thing about these headphones. For an affordable studio set, you get a fairly flat response. That is, until you reach the trebles. There is a considerable dip in the higher frequencies, which can be ironed out with a versatile EQ. In all honesty, it’s not a big deal. What matters the most is that there is no obvious bias in the lower end or mid range. That is something you often see with affordable headphones. Sound stage is decent although you won’t get that spatial definition. Wearing ATH-M20x for a prolonged period of time is doable, but the stock pads might become an issue over time. Good thing is that they are deep enough where you won’t bruise your ears. Compared to some other affordable studio monitors, ATH-M20x does a great job. 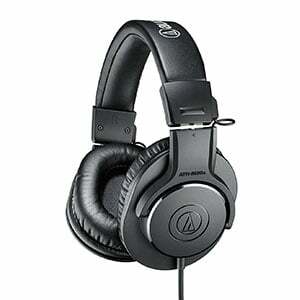 For more info about the Audio Technica ATH-M20x, click here. 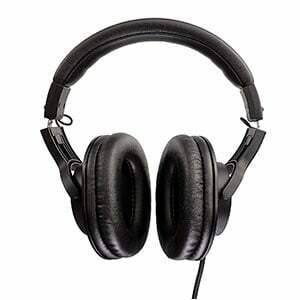 For more Studio Headphones Under $50 you might like, click here.